I called the Mississienwa Battlefield Historical Group, and they told me they never heard the name Hobbit Land. The name of the place is the Original Battlefield of 1812. Me and a friend went out there one night and did an investigation for two hours. We caught 4 or 5 EVPs, each of them is very weird. We also took a lot of photos that night, 53 to be exact. 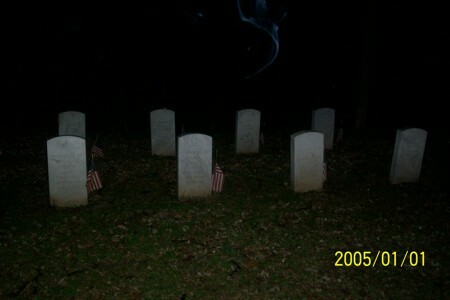 Out of those pics 2 of them revealed a very pronounced orb and figure hovering over a headstone.